105 Beacon is located on the south side of Beacon, between Arlington and Berkeley, with 103 Beacon to the east and 107 Beacon to the west. 105 Beacon was built ca. 1862, one of six contiguous houses (101-103-105-107-109-111 Beacon) built at about the same time and in the same style. Click here for an index to the deeds for 105 Beacon. On January 1, 1863, 105 Beacon was purchased from George Upham by Mrs. Louisa Ann (Walter) Adams, the widow of merchant Benjamin Adams. She previously had lived at 13 Beacon. Living with her were her daughter, Helen Curtis (Adams) Everett, the widow of Dr. Edward Brooks Everett, a physician, and their children, Edward and Louisa Everett. On June 1, 1881, Louisa Adams transferred 105 Beacon to Helen Everett. Louisa Adams died in November of 1885. After her death, Helen Everett and her children continued to live at 105 Beacon. On October 17, 1898, 105 Beacon was purchased from Helen Everett by Emilia M. de Angelis. 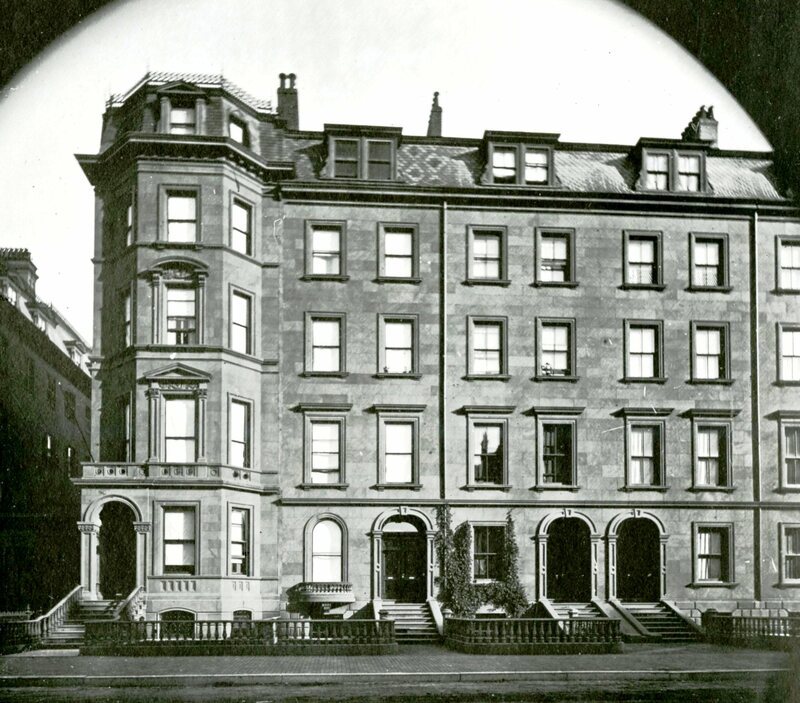 As part of the sale, the Helen Everett was permitted to continue living at 105 Beacon until July 1, 1899. By the 1899-1900 winter season, she had moved to 32 Fenway. Emilia de Angelis was a music teacher and the former wife of Dr. Trefflé Garceau, a physician in Roxbury, from whom she was divorced. 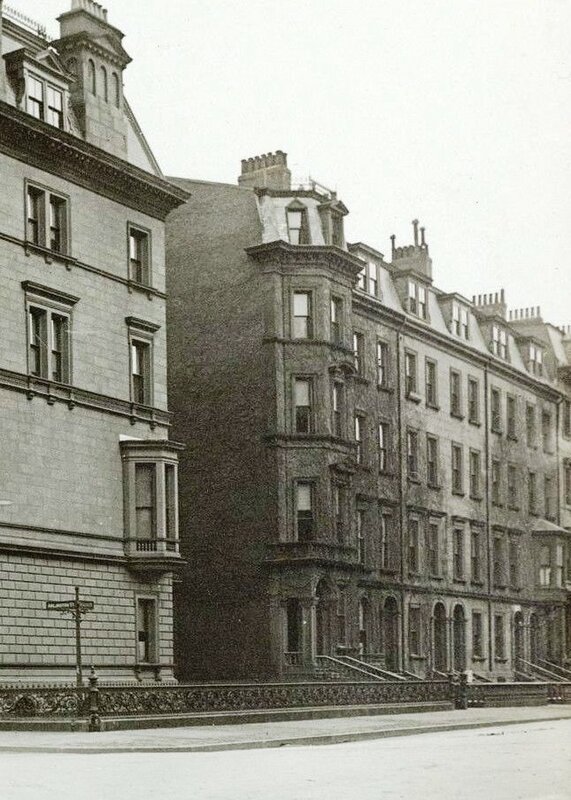 She listed herself in the Blue Books and City Directories as “Madame E. de Angelis.” She lived at the Hotel Bristol (northwest corner of Clarendon and Boylston) until Mrs. Everett moved, after which she made 105 Beacon her home and operated it as a lodging house. She continued to live at 105 Beacon until her death in February of 1904. 105 Beacon was inherited by her son, attorney Albert Garceau. He and his wife, Minnie (Baden) Garceau, made it their home and continued to operate it as a lodging house. They previously had lived at 31 Chestnut. By 1906, they had moved to 26 West Cedar. During the 1905-1906 winter season, 105 Beacon was the home of Dr. Edward Rolfe, a dentist, and his wife, Ella (Allen) Rolfe. 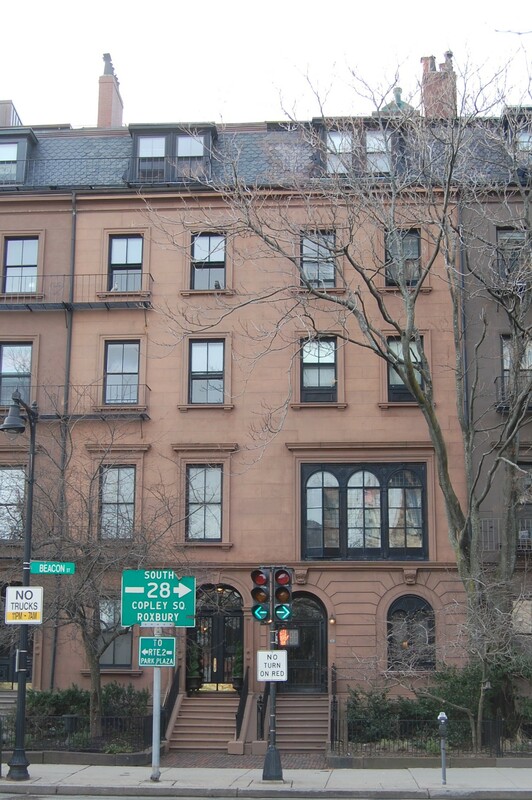 He maintained his practice at 149 Newbury in 1905 and at 419 Boylston in 1906. Their usual residence was in Brookline. On September 13, 1906, 105 Beacon was acquired from Albert Garceau by Mary L. (Harmon) Hellier, the wife of attorney Charles Edward Hellier. They previously had lived at 31 Hereford. They also maintained a home in Marion, Massachusetts. 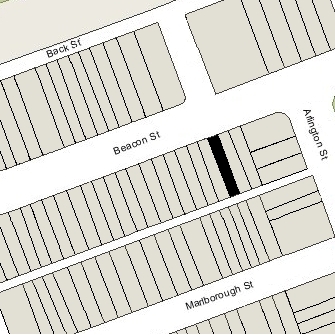 During the 1919-1920 winter season the Helliers were living in Marion and 105 Beacon was the home of Milton Strong Thompson, a manufacturer of chemicals and rubber sheeting, and his wife, Abigail Adams (Johnson) Thompson. They previously had lived at 208 Beacon. They also maintained a home in Newburyport, which they made their year-round home in 1921. 105 Beacon was not listed in the 1921 Blue Book. 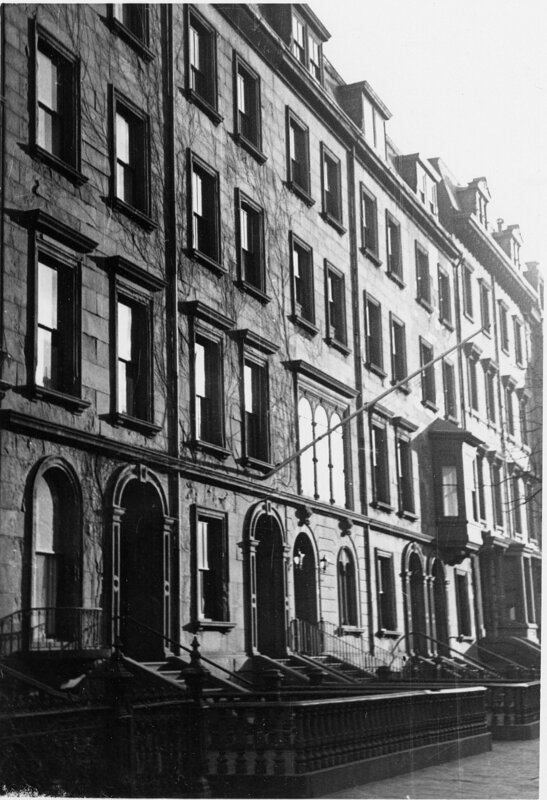 The Helliers had resumed living at 105 Beacon by the 1921-1922 winter season, continued to live there until 1924, when they made Marion their sole residence. Mary Hellier continued to own 105 Beacon and lease it to others. During the 1924-1925 winter season, 105 Beacon was the home of Robert Frederick Herrick, Jr., and his wife, Thelma (Hall) Herrick. They previously had lived at 146 Mt. Vernon. Robert Herrick, Jr., was an investment broker and served as an officer or director of a number of business firms, including as treasurer of the Saco-Lowell Shops (in the 1920s, and possibly later), and later as vice president of the Essex Wire Corporation of Detroit, the Reed-Prentice Corporation of Worcester, and Scott & Williams, Inc., of Laconia, New Hampshire. By mid-1925, they had moved to to 164 Beacon. By the 1925-1926 winter season, 105 Beacon was the home of George Lewis Batchelder, a coal dealer, and his wife, Louise (Lawrence) Batchelder. They also maintained a home in Marblehead. They previously had lived at 3 Louisburg Square. They continued to live at 105 Beacon until about 1931. On June 2, 1931, Clarence Haendel Pond foreclosed on the mortgage he held from Charles and Mary Hellier, and took possession of 105 Beacon. He was president of Ivers & Pond, piano manufacturers, and lived in Winchester. 105 Beacon was not listed in the 1932 and 1933 Blue Books and was shown as vacant in the 1932 and 1933 City Directories. In September of 1933, Clarence Pond filed for (and subsequently received) permission to install a fire escape on the rear of the building. On the permit application, he indicated that the building was to be used as a lodging house. By 1934, 105 Beacon had been leased by Erskine School, probably as a dormitory. 105 Beacon remained an Erskine School dormitory until about 1942. By 1943, 105 Beacon was the home of Mrs. Ina Irene (Moriarty) Somers Sleight, the former wife of Solomon Somers (Sobotka) and of Edward William Sleight. She previously had lived at 16 Pinckney. In April of 1943, she applied for (and subsequently received) permission to convert 105 Beacon from a school to a lodging house. It continued to be owned by Clarence H. Pond. Clarence Pond died in February of 1957, and on March 13, 1958, 105 Beacon was acquired from his estate by Shirley Clifford Speed, a real estate dealer who converted many Back Bay houses into lodging houses or apartments. He also owned 107 Beacon which he had converted into apartments. Ina Irene Sleight continued to live and operate a lodging house at 105 Beacon until shortly before her death in 1959. On July 19/20. 1961, 105 and 107 Beacon were acquired from S. Clifford Speed by Thomas Francis Keating, Jr., trustee of the Pond Realty Trust. 105 Beacon continued to be operated as a lodging house. 105 Beacon remained a lodging house. On September 15, 2005, 105 Beacon was purchased from Doris Pena-Cruz, trustee of the Green Nominee Trust, by the 105 Beacon LLC (David J. Pogorelc, manager of record). The Green Nominee Trust retained 107 Beacon. On February 7, 2006, 105 Beacon LLC converted the house into eleven condominium units, the Heaven on Beacon Condominium.